So it became true. Along with Rachel and Misha (both NZL) I left the Youth Hostel Plakias. 11 adventurous days and a few kilos of raki and wine have left their marks. Yes, the people in Crete order wine and raki in kilo, not in liters. That’s pretty funny for me. Before we left, the hostel manager Uli asked us, do perform our song, the unofficial anthem of the hostel, one more time. He wanted to recordit.nAnd what Uli prepared, was brilliant. After the season in Plakias he works in the German film industry as first camera assistant for international and national productions. So I wasn‘t surprised, that Uli came up with two professional cameras and even a professional sound-recording device. So the small recording became a semi-professional shooting. Unfortunately, I can’t present you the result, yet. Uli will cut a semiprofessional clip and needs time to do so. He’s living on Greek time, so nobody knows, when he will finish it. But as soon as I hear something, I will publish the clip here, of course. My next destination was Santorini, the volcanic islands of the Aegean sea and the secondmost famous destination of Greece, after Athens. Once again: perfect timing. 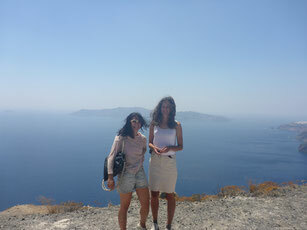 Misha (NZL) wanted to spend a few days on Santorini too, before her flight back home. So we traveled together after we said goodby to Rachel in Rethymnon. We took a ferry to the most expensive island in Greece. It took about 6 hours overnight. On the ferry, we prepared ourselfs a bed in the stairwells. Many travelers lay down here and tried to get some sleep. Unfortunately, the ferry was a "little" late. Which means that we didn’t arrived at midnight, but at 4:30 a.m. What a pitty, I could have saved the expensive accommodation in the hostel. It's incredible how expensive everything is, even the hostels. A night in a dorm room starts at about 37 € per night (high season). However, I was lucky to get a small hotel with a shared room. Here they carged me 25 € a night. So I was lucky, that I randomly booked the room a few weeks earlier. 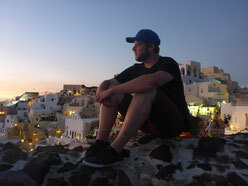 Misha stayed in another hostel, but in the same city called Perissa. I could leave a lasting impressioon at my new roommates, rather quickly. Just after my arrival, about 5 a.m. the hostels cat jumped into the dorm. Vicky, the good-hearted owner and I had to hunt and catch it even while everyone was asleep. But when this was done, I slept like a baby...and indeed long. The time in Plakias was exhausting, but perfect! I spent some wonderful hours with Misha. We visited the "highlight" of the island. A sunset in the ancient city of Oia. It’s almost cruel, how many people, probably all tourists of the island at once, wanted to be there. It was partly impossible to get through the streets, and it reminded me of the crowds at rock festivals. It’s been definitely nice, but we quickly moved on the shady side of the city to enjoy in peace the beauty of the place. After the huge masses were gone, we went to the hot spots of the city to admire the city lights at dusk. Whether I recommend it? Yes, definitely. It is fabulous and unique. The crowds are here for a reason. If you’re clever, you can find some nice little paths, where you can enjoy the city more calmly. After a day in bed, I was still not quite fit, I allowed myself another tourist attraction. 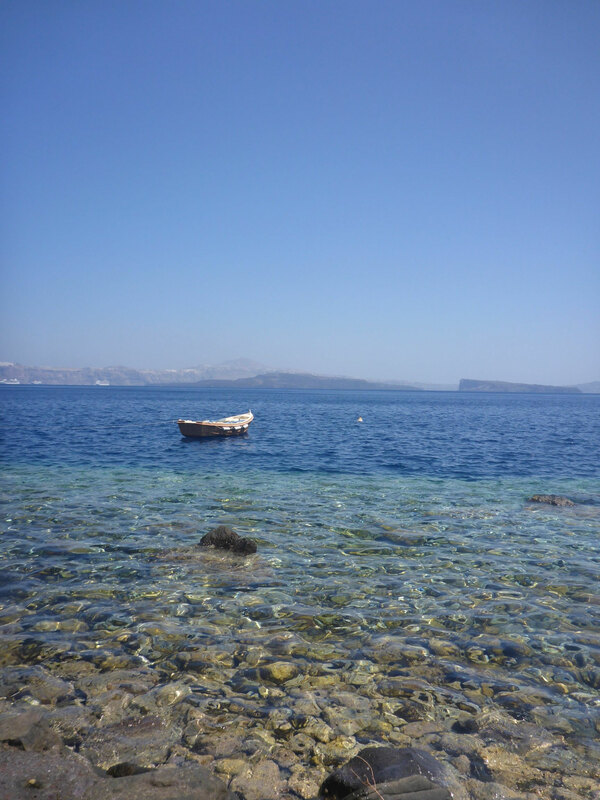 A boat tour around the islands and to Santorini's caldera. It is a small archipelago and aligned to 90% on tourism, so I it’s nearly impossible to escape the classic tourism, unfortunately. But that's okay. Sometimes I’m a traveler, sometimes a tourist. After breakfast and a double Greek coffee, which was surpricingly included in the night, the bus took my down the narrow streets on the cliffs down to Santorini’s new port. A beautiful, old wooden ship was my base for that day. Well at least the made it look old. First stop was the central volcanic island. Well, actually all islands of Santorini are part of a gigantic crater, but here on this island are the latest 5 craters of the volcano, which are still active, of course. The eruption of the volcano Columbo (or something like that, now called Santorini) about 3,600 years ago, supposed to be the largest or most destructive eruption in human history. It extincted the Minoan civilization and destroyed hundreds of ancient cities in the Mediterranean. The ash cloud has even made it to the present United States. The island, where the active crater are located, was formed by the last major eruption 430 years ago. So still very young. The last eruption of the volcano is younger. In 1950, the outbreak and its consequences (earthquake, tsunami) destroyed almost all the buildings on the island. 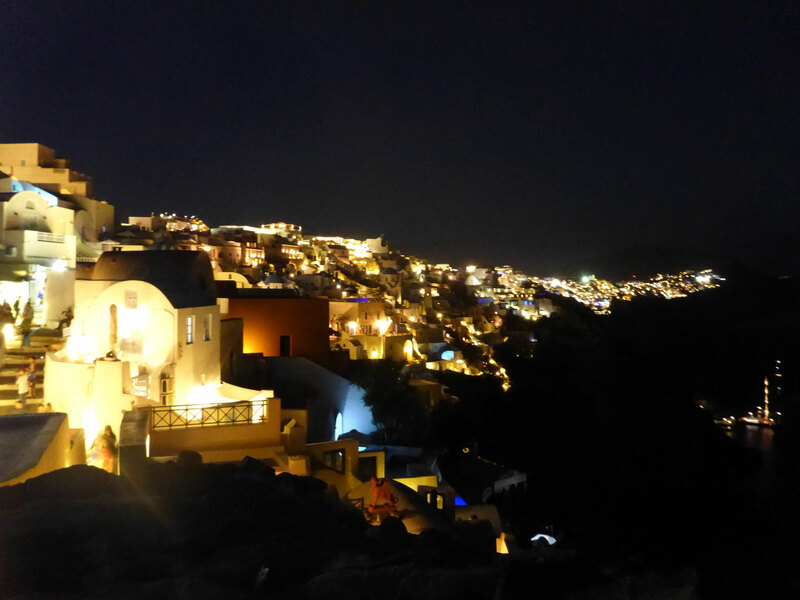 Only the cave houses in Oia and Fira (capital) have survived. Today the volcano is constantly monitored and the experts claim, that they can predict an outbreak about 1 year in advance. The small micro-earthquakes, which happen approximately every 15 days, rocking the archipelago barely noticeable. The walk through this young volcanic desert, was very impressive and, as you might noticed already, the informative tour has left a lasting impression on me. Then we went to the hot springs at the edge of the crater island. Nice, but I expected more. Beautifully muddy and good 26 ° C warm, it was more of a thermal bath. But there was this very funny African-American, who, as we all covered ourselfes with mud (if it cleans or dips was not the question), yelled and claimed, that it doesn’t work on his skin, because he could not see it. 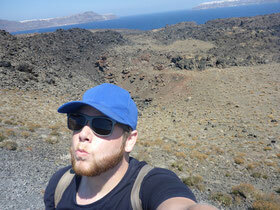 Then we went to the second largest island of Santorini. Here I ate lunch and went swimming. 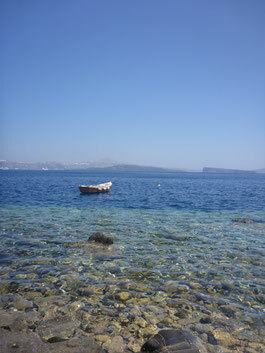 Very idyllic and a bit quieter than the main island of Thira. We passed the impressive cliffs of Thira and after about twelve hours on tour, I was happy to get some rest. My friend Rachel, who picked up her friend Rebecca (NZL) on the Greek island of Kos, wrote me, thy, that the two are on their way to Santorini. And indeed just after midnight, their ferry was on time of course, they arrived at my Hotel. None of us would have thought, that we see us so soon again and celebrated our reunion. Rebecca had some storys to tell, because she was in Turkey during the coup. But according to her experiences it has’nt been that bad for her. We sat together with the hotel owner Vicky and had a good time outdoors at the communal table. Vicky and her family are great. The Athenian family runs a small hotel, which is also home for 2 cats and 3 dogs. I loved to joke with Vicky and was very impressed that they could remember all names of the guests without any Problems and she had really fun making the guests known to each other. The next day the ladies from New Zealand and I hiked through the volcanic desert of Thira. And this at the hottest time of the day. It was really exhausting. Not the hike, but the heat. No shade, no water on the road. But however, unique rock formations and spectacular paths through the cliffs and hills were challenging and rewarding at the same time. Unfortunately, there was no affordable bed available throughout the whole island. So we decided to spend the night at the beach. Vicky equipped us with blankets and best wishes and we settled down at the black beach of Perissa. First, with a somewhat uneasy feeling, because of all those clubs and taverns, which produced one drunken guy after the other, but the later it got, the more beautiful, quiet and romantic it became. Due to the strong winds, the girls have built a castle out of sunbeds and we could spend the night undisturbed. As a reward, there was a wonderful sunrise and a refreshing sea bath at dawn. In that night we decided to go back to Crete. Back to Plakias. The place where we felt so comfortable. 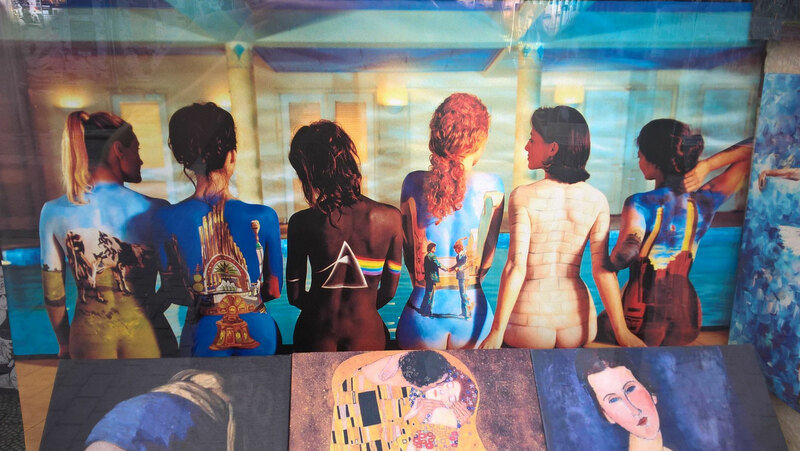 I was torn for a while. My head wanted to move on, discover new things and make a „progress“ somehow. But why? Why should I feel comfortable in progress? What means progress? So I released the pressure and do what apparently just feels best. A clever saying says: It does not matter where you are traveling, just go out and spend time with people that surround you. And since I'm with Rachel, Rebecca and the other hostel guests in Plakias, who are all just unique and awesome, we decided to get back. So it was our last day on Santorini. 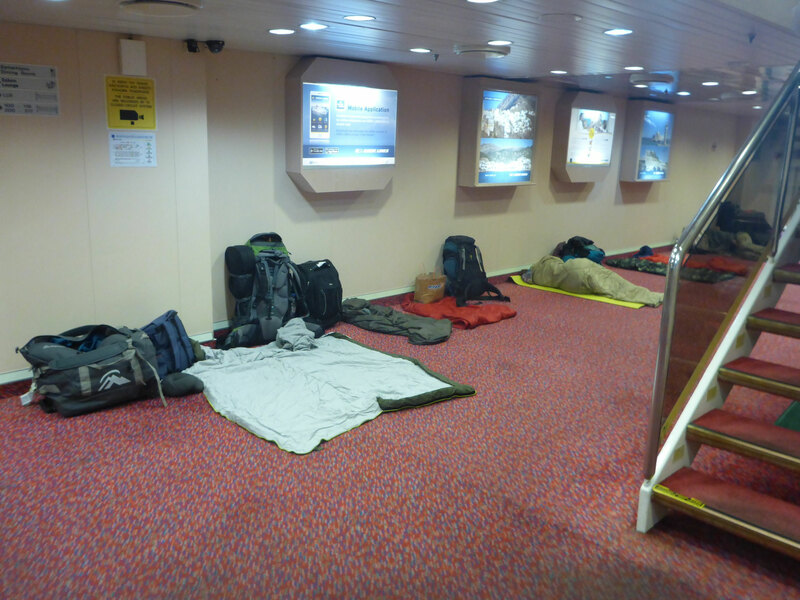 The ferry to Crete was leaving at 4:00 a.m. in the morning of the next day. So we had plenty of time to discover the island one’s more. 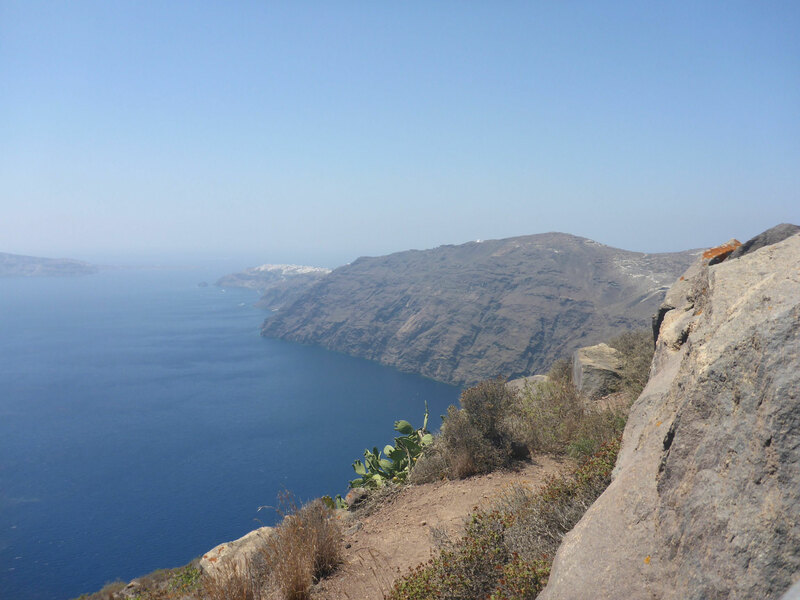 I can say: We have explored the entire main island of Thira in just one day. We decided to invest in two ATV / quads. Incredibly funny. At first a little cautious, we went off. 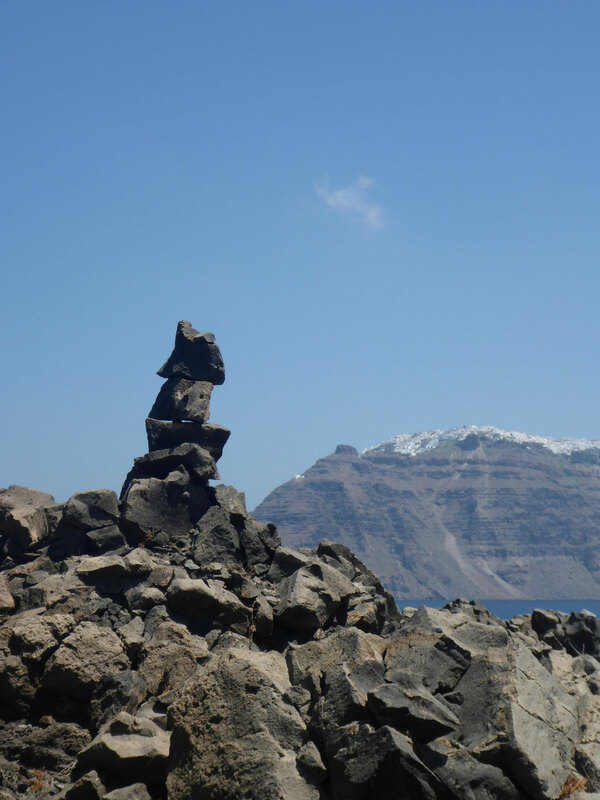 We literally visited every village on the island and had breas at unique places such as the red beach, the old lighthouse and the ruins of ancient Thira, at the highest point of the island. Over time, our driving skills were getting better and we got more courageous. So we raced, with our 100cc machines, offroad on sandy slopes andvolcanic rock. On the east coast of the island, we spend some time watching kite surfers doing their sport. That was pretty impressive. One of the kite surfers jumped 15-20m height and 100m distance, by estimation. 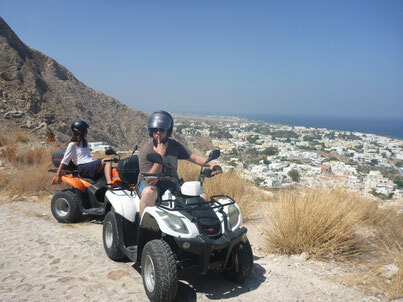 I really can recommend an individual discovery tour of the island with ATVs. Just by turning left or right, without a plan and goal, we discovered wonderful places that are partially completely free of tourists. Old inhabited villages, which are full of authenticity, exciting trails and roads in the cliffs or over the mountains of Santorini. There are living approx. 3,000 Greeks on Santorini. Compared to > 2,000,000 tourists a year, that’s nothing. All that would have been impossible, if not Vicky, the landlady, had offerd her hotel as our base for 2 days. Although we had already checked out, we always have felt very welcomed and Vicky has always supplied us with fresh coffee and ham and cheese toast. So our time on Santorini went to an end. Until our ferry departed, we enjoyed the time with heated discussions, lots of laughter and star gazing. On the ferry had to find a suitable place to sleep and the next day, we were taking buses and gladly arrived in Plakias. And here I sit again. On the same place where I wrote the last report... I'm fine. Well, apart from a small hangover of last night. Since the hostel is just overbooked, Uli has prepared a cozy place on the terrace of the bungalow. Far too many options for tours, sightseeing and culture are facing ue. Still, there is so much to discover and I’m really looking forward to the upcoming days. - A nap in the park. When I woke up, a stray dog was lying just beside me. At least, he was as surprised as I was. We became friends. - I actually thought, it would be a typical German thing, to speak everything badly that happens. But the Russian roommate perfected that. Poor lady. - Maybe I have the chance to volunteer on the island Gavdos, the southernmost point of Europe, for a month. They need help in a small hotel complex with farm. Let's see. - After a month I still live over my budget. On average, 125% of my planning. - Crazy Salad. A specialty of the region: watermelon, feta, salami and nuts. Not too bad. - It took me a whole month to realize: If the Greeks says "Ne," it means Yes. It’s just the other way round in German. - Once a local bus driver was refuelling. Disregarding any schedule. I’ve never experienced somehting like this so far. Mr. bus driver had to pay 380€.